Ross Curtis of Invesco Aim spoke on the attributes of a successful sales person during a recent Partner Day talk. 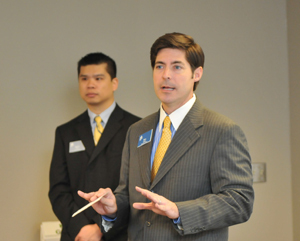 PES graduate Kevin Ta (’04), pictured left, discussed his role as an internal wholesaler at Invesco Aim. Good sales people know the importance of good relationships. It’s no secret, but for some reason, some get it while others don’t. In the Program for Excellence in Selling at C. T. Bauer College of Business, the power of good relationships is not only taught in the classroom, it’s exemplified in every facet of the program’s success. As a part of the Sales Excellence Institute, PES fosters relationships with corporate partners who bring value to the program each semester by lecturing in the classroom, mentoring, sponsoring professional development opportunities and recruiting. These partnerships give graduates of the program a unique edge in the sales force. “Through the Program for Excellence in Selling, I have developed relationships with some of the leading companies in the nation, like Liberty Mutual, Ecolab and AstraZeneca,” says Mahnaz Cinquegrana, a second semester PES student. “The program opens doors to endless opportunities for those who want to take advantage of them,” she adds. As a testament of the program’s success, many of the companies that participate choose to continue their partnership year after year through the Sales & Marketing Career Fair, a semi-annual golf tournament and other sponsorship opportunities. Corporations also get involved through PES’s Partner Day initiative. Each week, PES invites a different corporate partner to the classroom to speak with students about working in sales. Students get the chance to interact with a variety of business professionals, many of whom graduated from the program themselves, and learn what goes on day-to-day in a sales role. Invesco Aim internal sales manager Ross Curtis recently attended a Partner Day visit with PES alumnus Kevin Ta (’04). He says the relationship with PES has introduced his company to students, who like Ta, play a vital role in his sales force. When it is time to hire, having access to a pool of students who are highly motivated and have real-world experience is one perk of being a partner. Each semester, nearly 100 students graduate from PES, and many end up working for partner companies. PES Director of Partner Relations Susana Rosas and her team go out of their way to make sure the partners receive value from the relationship in other ways as well. This includes giving partners priority access to faculty research and advisors, positions on the advisory board and audit seats in the sales program. As SEI approaches its 15 year anniversary, Rosas says it’s the support of their corporate partners that continues to make PES one of the most successful collegiate sales programs in the country.